The recent legislative elections in Québec have made French-speaking Canada front page news this week. The history of French and francophone peoples in Canada stretches back centuries, since the first French explorers came to the Western Hemisphere in the 16th Century. 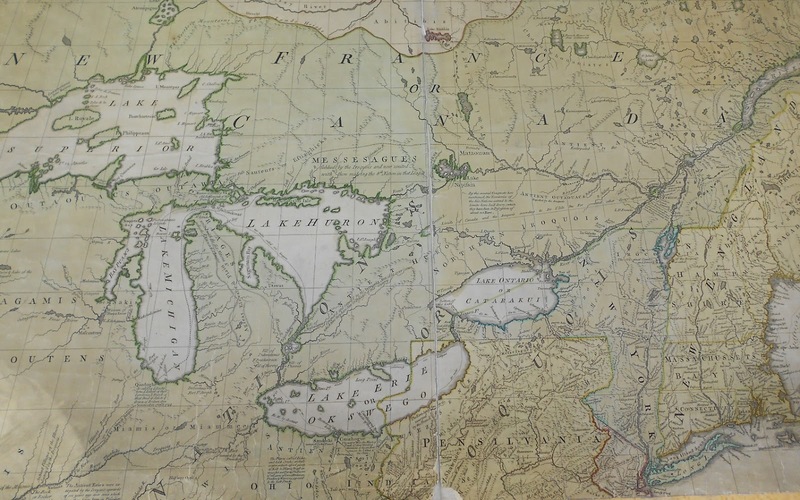 Over these nearly 500 years, there has always been a large francophone presence in the North America, which at some points in history has included Michigan and the Great Lakes region. 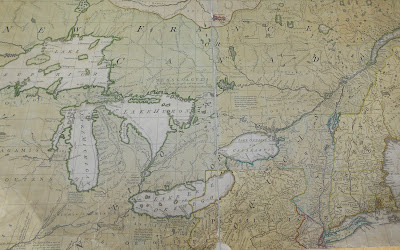 As part of the Clarke Historical Library’s mission to collect and preserve materials documenting the history of Michigan, including territorial and pre-territorial periods, we have a large collection of documents that cover the history of French exploration and settlement in North America. These include bound volumes such as Pierre F. X. Charlevoix’s report of his voyage to New France in the early 18th Century and the Voyages of Jacques Cartier from the 16th Century. 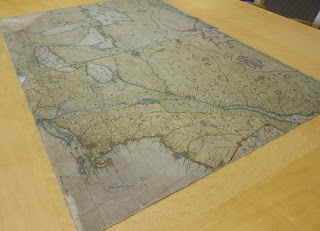 It also includes several maps that are part of our Jenks Collection. There are numerous 17th and 18th Century maps – in Latin, French, and English – that chart the evolution of the territory of New France, or Canada. The particular map featured in this posting is an English language map from 1755, created by John Mitchell, an Englishman, showing how the land in North America had been divided in the middle of the 18th Century. In 1750, Mitchell was commissioned by the Board of Trade and Plantations to create a map of the British colonies in North America. Commonly referred to as a Mitchell Map, this map shows a great amount of detail of the known territory in North America at the time. In fact, this map was consulted to define the boundaries of the newly-formed United States at the Treaty of Paris in 1783, after the Revolution. With regards to New France, or Canada, one can see that the territory includes much of the northern part of this map including most of the land north of the St. Lawrence River from present-day Newfoundland and New Brunswick in the east to Manitoba in the west and south to encompass the entirety of Michigan (click on the map for a larger image). The political boundaries and arrangements that we know today in North America have a long history. This history, from the time of the first explorers to the 19th Century fur traders and Jesuit missionaries, is chronicled in the maps, documents, and scholarly analyses that are held at the Clarke Historical Library. For further information about the long history of the French in Michigan, visit our web-site and view the exhibit catalog (in PDF format) from a 2008 exhibition When France Claimed Michigan.